Hi! I’m Chelsea, a Certified Transformational Nutrition Coach. After years of dieting & disordered eating I turned my mess into my message. I help women world-wide ditch dieting forever, create a healthy relationship with food & live a life they LOVE free from rules, restriction and obsession. Download my free (mini) ebook “Break Free from Disordered Eating”. Purchase my self-study online program Wellness Babe! Join my private Facebook Group. For the last 6 months I’ve been working with a really wonderful acupuncturist doing acupuncture and cupping for my back and joint pain, emotional wellbeing and gut health. I had done acupuncture before (in 2014 when I initially injured my back) and honestly didn’t have the best experience. But from my first session with this practitioner, I knew my experience would be positive and impactful. I absolutely love her approach to wellness and she takes time with me each session to explore each and every imbalance on a physical and emotional level with the plan to bring everything back into balance. She believes pain and compromised health are often the result of stuck or stagnant energy, and each session we work to get things moving and released. I feel amazing every single time I go and I’m so lucky I found a place and practitioner that I love. Even though I live in Los Angeles, I’ve had some really poor (might I even say traumatic) experiences with practitioners and treatments. So after 4 years of lots of PT’s, chiropractors and doctors that I didn’t like so much or enjoy going to, this is a relief! Bonus? My visits are covered by my health insurance. And again, this is a FIRST. Believe me I’ve invested in my health on a level that may shock some of you! So, if you’ve been interested in trying out acupuncture and haven’t, see if it’s covered for you. It very well may be, and then what are you waiting for!? I think anyone and everyone can benefit from this type of bodywork. If you’re in the Los Angeles area I see Calley at Seed of Life Acupuncture in Hancock Park and couldn’t recommend it enough. Ok wow- back to celery juice and the point here. I brought up my acupuncturist because she recommended the celery juice to me and it’s quickly become one of my favorite healthy habits. She initially read about it in a book called The Medical Medium. He believes cleansing, detox, and essential nutrients from real whole foods are the core to fighting infections and illness. 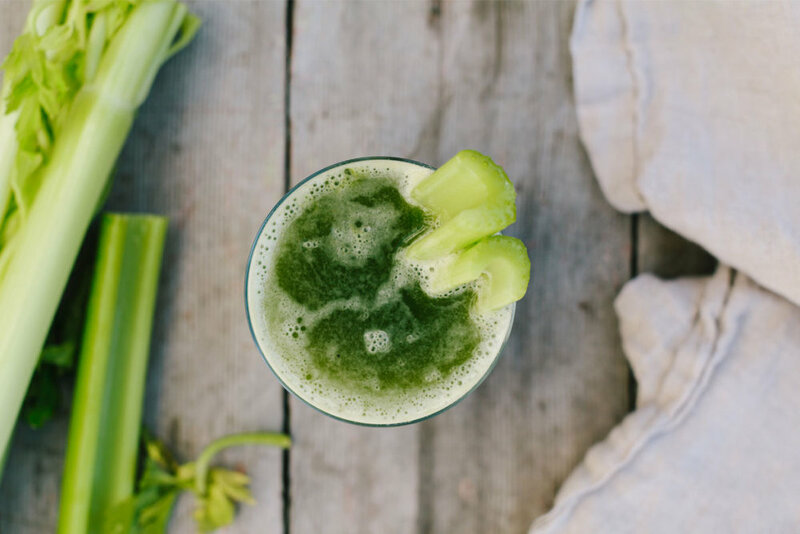 Celery juice is incredibly cleansing and drinking it in the morning can be used as a therapeutical tool to improve your digestion and overall health. Celery juice is alkaline, anti-inflammatory and a natural diuretic which promotes liver cleansing and toxin release. It can also stimulate HCL (hydrochloric acid, also known as stomach acid) which is something I’m always trying to do after years on an acid blocker/PPI called Prilosec. Important reminder- heartburn and conditions like GERD are not from and overproduction of stomach acid, but an underproduction. If this is something you are struggling with here are some tips…chew the heck out of your food, consider HCL or digestive enzyme support and make a point to drink water and other liquids away from meals (vs. during). These tips can help to stimulate, promote and build back stomach acid which is crucial to digesting our food. Another point, are you bloated? You’re likely low on stomach acid! PPI’s, stress and processed food ALL play a role. So if you’re a human living on earth, this may be you! A note on juicing in general: Well, I’m not a huge fan of juicing. And why there is a time and a place absolutely, it’s definitely not all it’s chalked up to be as a miraculous health habit. Why? Well long story short- when we juice we remove the fiber from the fruit and vegetables and while nutrition remains the fiber is lost. Fiber is not only crucial for digestion and strong bowel movements, it feeds our good gut bugs and acts as a buffer to slow down the natural sugar from fruits and veggies that can spike our blood sugar. It’s in that complete package for a reason, nature knows whats up. Most juices and even many green juices are total sugar bombs. Seeing apple in there? There may be 2 and a half apples, but not whole fibrous nutritious apples- just the fruit juice. This all being said I do enjoy a green juice every once in a while that I make at the Whole Foods juice bar, but I make it actually ALL green. This is usually my order: celery, cucumber, spinach, lemon, ginger. Ok again, back to the point. This is why I don’t own a juicer! But I am into celery juice and the therapeutic properties so what do I do here!? My method (because I do not have a juicer): I take one bunch of organic celery, wash and roughly chop the stalks and throw them into my Vitamix. You can use any powerful blender but I very much recommend using a Vitamix that has a tamper - since we are "juicing" and not blending with extra liquid this is crucial to get the celery blended down enough without having to add any extra water. If you do not have a Vitamix or a blender with a tamper you may have to add some water to get everything all blended up - obviously it's not as ideal but we're not going to let perfect be the enemy of the good here, right? Next step - using a nut milk bag (I love Ellie's Best - use code NUTRITIONCHELSEA for 10% off if you'd like to grab your own!) I strain that mixture into a big bowl with a spout and pour it into my glass. A serving is 16 oz, but I seriously encourage you to start small and work your way up - especially if you have a sensitive digestive system. It's also recommended to have on an empty stomach and 30 minutes before anything else (other drinks or food). (Update) - I now have a juicer. I have THIS ONE from amazon and love it!! Obviously if you have a juicer- this makes more sense and you can juice away! *And nothing against any of you who find juicing to be something you love because I think that's great! Remember we’re all different and this is just my HONEST opinion. It’s my belief that juicing should be used therapeutically and should be filled with greens and veggies not a ton of fruit. For all the instructions for how to do this, plus further information on the conditions celery juice can help you with (which is many!!) check out this article by The Medical Medium. Check back in with me if you give it a go! Or comment below with any questions or further insight!